Photo by www.chrispluslynn.com Planning and Design by www.elenadamy.com | What a gorgeous spot for a wedding reception! The sun sets over the Pacific just before the grand entrance of the bride and groom on the terraces of the resort. 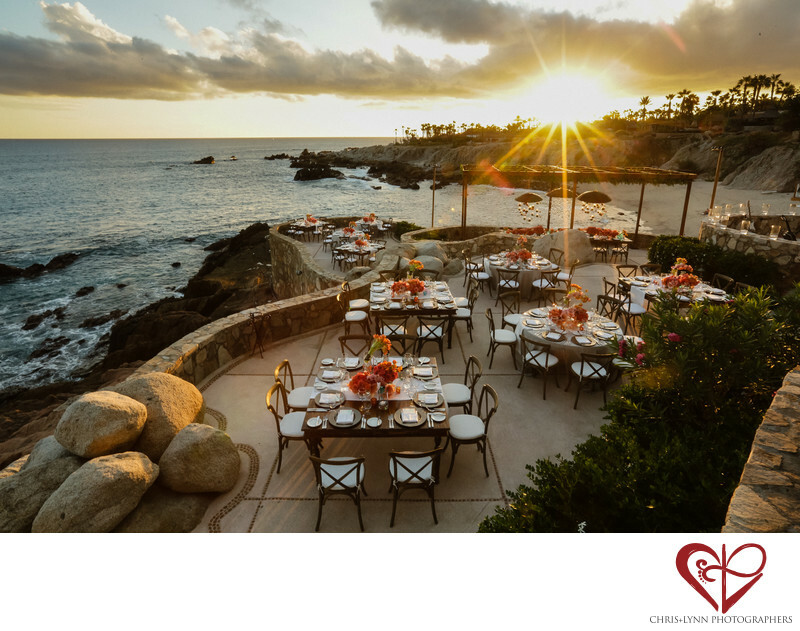 Esperanza resort is one of our favorite venues for a destination wedding in Cabo Mexico because it allows couples and guests to enjoy a beach wedding without needing to get sand in their shoes! Throughout the property there are locations for ceremony and reception where the beach and ocean are visible with no need to take off your high heels. Of course, we always love to do bride and groom portraits on the beach too! As Cabo wedding photographers, our favorite wedding venues in the Los Cabos area our include Villa Santa Cruz, Rancho Pescadero, Hotel San Cristóbal, One & Only Palmilla, Esperanza Resort, The Resort at Pedregal, Hotel El Ganzo, Pueblo Bonito Sunset, Club Campestre, The Cape Hotel, Sunset Mona Lisa, Chileno Bay Resort, Cabo Azul, Flora Farms, Las Ventanas, Villa Bellisima, Villa Vista Ballena, JW Marriott Los Cabos, Hilton Los Cabos, Riu Palace, Riu Santa Fe, Hyatt Ziva, Pueblo Bonito Pacifica, Secrets Puerto Los Cabos, Dreams Los Cabos, Hacienda Beach Club & Residences, Sandos Finisterra, Grand Solmar, Casa Dorada, ME Cabo, Hacienda Encantada, Marquis Los Cabos, Cabo Surf Hotel, Hotel Mar Adentro, Secrets Puerto Los Cabos, Hacienda Cerritos, Las Cruces, and the Sheraton Hacienda del Mar. 1/30; f/22.0; ISO 800; 20.0 mm.